The fans have asked for it for years and the Crue gives them Entertainment or Death. 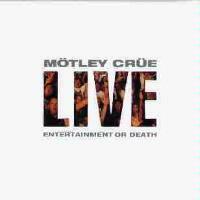 Entertainment or Death is Motley Crue's first live album since exploding on the L.A. scene nearly twenty years earlier. 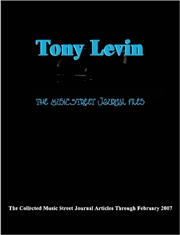 This double disc compiles live music spanning the bands entire career with the exception of their days with John Corabi and the less than well received Generation Swine. This disc also marks the first release since hip-hop wanna-be Tommy Lee left the group. He is, however, featured on all the songs in this set. Lee's cohorts on the disc are Vince Neil (vocals), Nikki Sixx (bass), and Mick Mars. One thing that should be mentioned is this. If you are a person who is easily offended by profanity, you should steer clear of this release -- if not, enjoy. Recorded on November 25, 1985, this one starts off fast and furious. It is a powerful and very chunky rocker that has a riff that seems firmly rooted in the sounds of old Kiss. Starting off just a tiny bit like Hawkwind, the major metal mode kicks in quickly. This is a strong rocker with a good vocal texture. This one was recorded on March 14th of '84. Coming from the same show as the last cut, this one starts with Vince leading the audience in a shouting session featuring the "f" word. The cut is a scorching metal number with a strong chorus. It features a very intriguing solo. Fast and frantic drumming begins this cut. Another screamer with a great crunchy guitar sound, this one has a great mellow segment for a bit of a change. After a false ending, the composition blasts back in. This song is from the same concert as the last two. Recorded on November 19th of 1982, this one starts with a nice audience sing along. This is a rather melodic rocker, and a very strong and entertaining piece. This is another cut that was recorded at the March, 1984 concert. Beginning with the rather spooky "In The Beginning", this song tears out with its classic riffs. Recorded at the same show as "Public Enemy...", this one starts with an almost sweet sounding guitar intro, and the verse is in a rather balladic mode. The cut then turns harder and heavier in a very tasteful manner. This whole number really has the texture of '70's metal/hard rock, rather than '80's metal. This is a very tasteful and strong composition. With a mode a bit like Kiss' "Calling Dr. Love" on the chorus, this is a good solid rocker and includes another sing along. This one is from a December 2, 1998 show. This is another song from the November, '82 show. A somewhat unusual arrangement leads to a rocker that is a bit out of the ordinary. A meaty rock and roller with a great older metal texture, this is a very strong cut. It, along with "Helter Skelter", was recorded at the same show as "Piece of Your Action". Crue's take on the Beatles only metal song, this version features an extended guitar solo segment and very interesting outro. Another cut from the November '85 show, this is the Crue's take on the Brownsville Station classic. It is good-time rock and roll. This version includes an extended intro and a short harmonica solo. Recorded 7/30 of 1990, this is an '80's Crue standard. It has a good balladic nature to it that sort of jumps into higher gear later. A fast paced, hard rocking number, this one seems that much harder after the somewhat sedate "Don't Go Away...". Recorded March 10, 1999, the slower section of this cut is particularly powerful and includes a meaty and tasty guitar solo segment. From the same show as "Ten Seconds to Love", this hard rocker sings the praises of girls at various strip clubs. A straightforward rocker in the Crue tradition, this one is from the March of 1999 show. It includes a somewhat differently arranged segment to differentiate itself from the studio version. A slow balladic love song, this is a strong metal ballad. The cut was recorded 7/31/90. Starting with bass, this is a pretty typical Crue rocker, but does include some tasty guitar sounds. This one is from the December 1998 show. For the sake of the non-offensive nature of this publication we won't list what Vince says this cut is about, as he introduces it, but it involves a portion of the female anatomy. This is a pretty standard Crue rocker. It is from the same concert as "Dr. Feelgood". Beginning with piano, this is strong rock ballad and a classic Crue cut. The original of this one is a bit on the over-produced side, therefore this performance is somewhat of a relief from that. This performance is from the December 1998 show. The last cut on the disc, this one was recorded at the March 1999 show. It is a hard rocking; fast paced metal cut that features a strong balladic section.